You know the kind of day that I mean, you're rushing from one place to the next, still need to get the laundry in, have nothing available for breakfast the next morning, and dinner is now late to the table. That was my day last Tuesday. So, when I came in the door from my volunteer work, I had to prioritize the last of the chores. Laundry -- we'd need clean things for the next day. Laundry takes a while, so that had to be job 1. Next, dinner - we needed to eat. 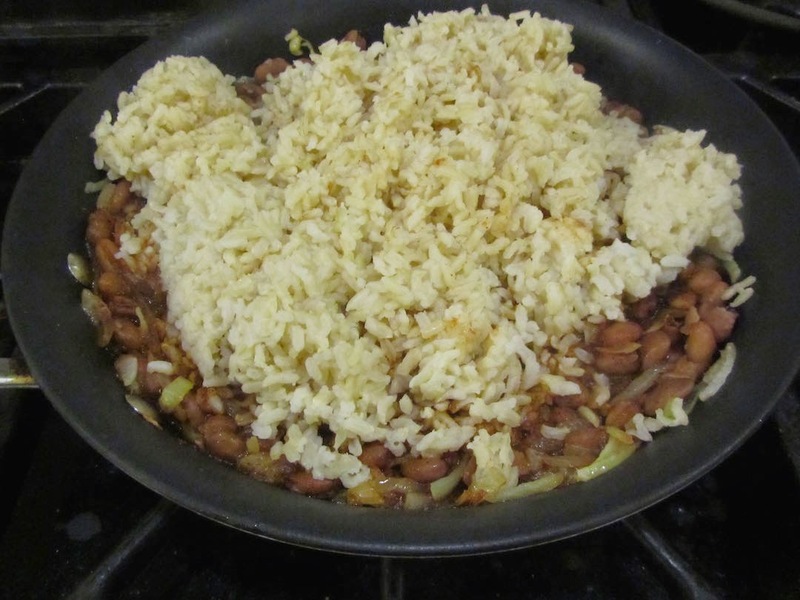 I had cooked rice and some beans on hand, so that's what we'd have for an easy dinner. Last, we were out of bread and granola. We would need something easy to grab and go for the next morning. I got a batch of muffin batter put together (this time, dried cranberry-orange zest). 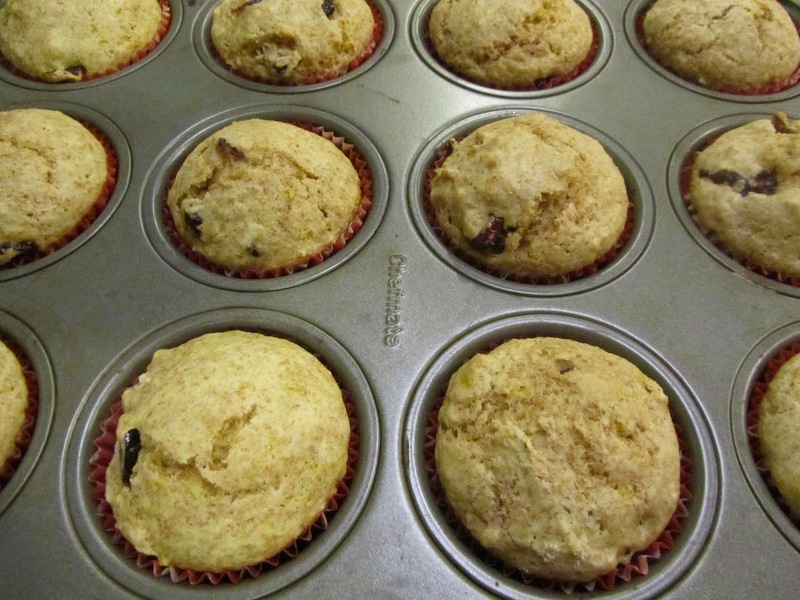 I've made the same basic muffin recipe for so many years that I have it memorized. And it's the same basic recipe that I use for both pancakes and waffles, as well, just altering the milk/liquid addition as needed for consistency of the batter. Because I don't need to consult a recipe card or cookbook, I can get a batch of batter ready to go into the pan in 5 minutes. 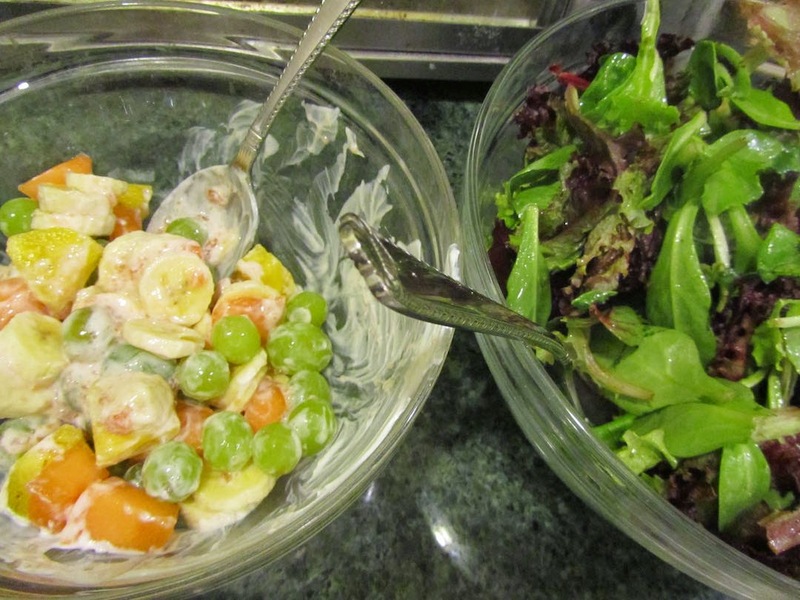 While the muffins baked, I put together a green salad and a fruit salad, to go with dinner. I had brought home some leftover, cut-up fruit from the reception where I hostessed. For the fruit salad, all I needed to do was add a banana and make a dressing with sour cream and jam. A dressing for the green salad was simply chive blossom vinegar, salt, dried garlic, dried onion and oil -- very quick and easy. When the muffins came out of the oven, the rest of dinner was finished. We ate our dinner while the muffins cooled on the counter. 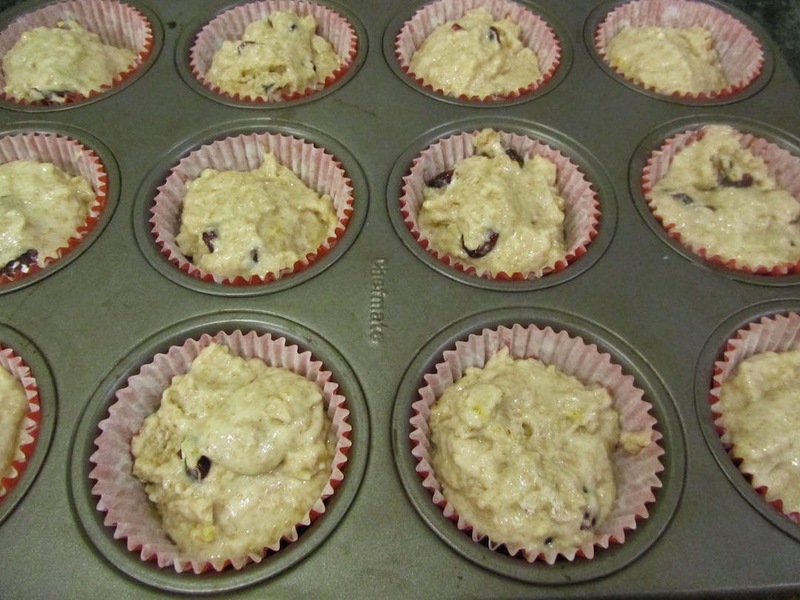 Muffins were bagged up and set on the counter for the morning's breakfast. Thank you for reading, this morning, and have a lovely day! Good for you! Don't you love it when you are efficient? I had a side thought to go out and buy dinner that night, and a box of pastries for the next morning's breakfast, but managed to get myself motivated to just do some simple cooking from scratch at home. So that made me feel empowered. Hope you thaw out soon, there! Brrrr! I saw a weather map for your area this morning. Make yourself a cup of tea or cocoa. We aren't quite as bitterly cold as the rest of the state--I think we were -2 this morning--instead, we get more snow--but it's pretty bitter out! I've been going through a lot of warm beverages! We have been having a lot of "thank You for electricity and indoor heating" prayers lately! While not nearly as cold as your area, it was in the low 30s this morning, and I did say a little prayer of thanks for a heated home. Sometimes when you're tired, it's hard to get started. But good for you and it must have felt great at the end. It did, live and learn, it did! Just getting myself going for a bit more, on one of those busy days, is the biggest hurdle. Friday was a day like this. Oldest daughter suggested going out to eat for dinner on Friday morning. I said I would think about it. When we got home that late afternoon, Dad was working and I asked her if she still wanted to go out. No food was prepared during the day since we were all gone the entire day and she didn't feel like it. We opted to stay home and made sautéed onions and peppers with sausage over white jasmine rice. She said it was soooo good. A happy ending since I don't love going out to eat anyway. I made a cheese cake and thawed some strawberries and he also had a very yummy dessert. What you made for your dinner sounds absolutely delicious! Good job! Isn't it funny how eating out can sound like the "perfect solution"? When in actuality, you were able to make something simple, but fresh and delicious, plus, enjoy your dinner in the comfort and peace of your own home. you made me laugh about your meal of cole slaw in the peppers with 3 crackers. Thank you! I can't describe just how much I needed that laugh right this minute! When my twins were babies, one of our favorite "meals" (if you can call it that) was cooked macaroni, canned tomato sauce (not even pasta sauce, just tomato sauce), with a handful of dried TVP thrown in for protein. Dinner in 7 minutes! We survived, somehow, despite some of those meager meals. It all worked out in the end, and it didn't cost us any extra money to feed ourselves.